Haroon Gunn-Salie with his artwork, Senzenina, 2018. Courtesy of the artist & Goodman Gallery. Cape Town-born artist and activist Haroon Gunn-Salie has been announced as the 2018 recipient of the highly coveted FNB Art Prize at the media launch of the 11th installment of the FNB JoburgArtFair. Gunn-Salie joins the ranks of previous winners such as Peju Alatise, Nolan Oswald Dennis, Turiya Magadlela, Portia Zvavahera and Kudzanai Chiurai. He receives a cash prize as well as the opportunity to create a new project that will be showcased in a dedicated exhibition space at the FNB JoburgArtFair this September. Faye Mfikwe, Chief Marketing Officer at FNB says that the FNB Art Prize honours exceptional artistic talent and, at the same time, provides the winning artist local and international opportunities for the artist and the industry. Gunn-Salie has established a collaborative art practice that translates community oral histories into artistic interventions and installations. His multidisciplinary practice uses a variety of mediums, drawing focus to forms of collaboration in contemporary art based on dialogue and exchange. 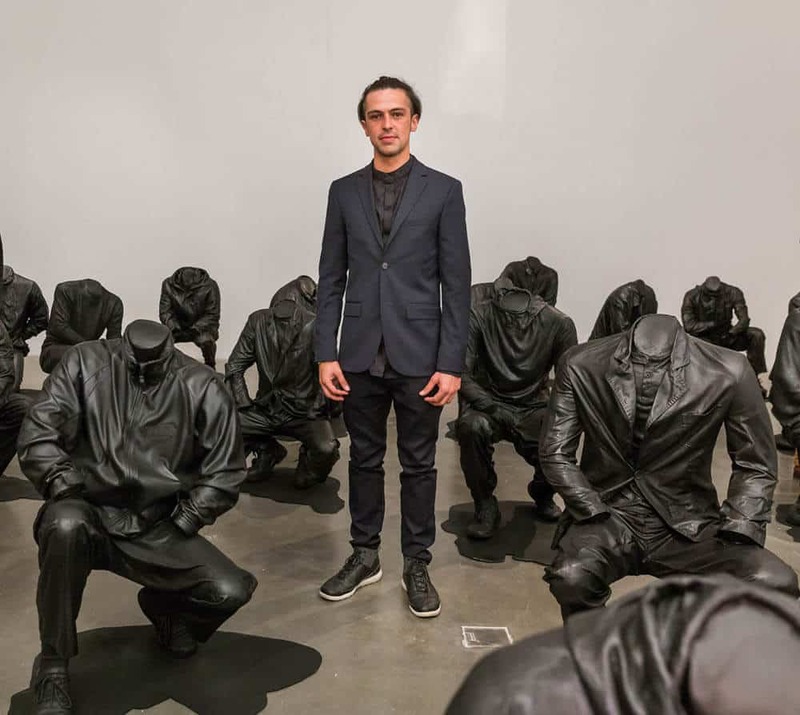 Currently based between Johannesburg and Belo Horizonte (Brazil), Gunn-Salie completed his BA Hons in sculpture at the Michaelis School of Fine Art in 2012. His graduate exhibition, titled Witness, presented a site-specific body of work focusing on still unresolved issues of forced removals under apartheid, working with veteran residents of District Six, an area in central Cape Town where widespread forced removals occurred. His installation for the FNB JoburgArtFair continues to delve deeper into unresolved issues in South Africa’s contemporary history with an extended site-specific installation of his project titled Senzenina. The installation – envisioned as a reflection space – transports the viewer to the site, inside which an immersive soundscape presenting a schematic recreation of the scene using archival audio and composed elements. The soundscape includes calls for the mineworkers to disassemble peacefully; the fortification of the surrounding area and entrapment of the workers by police; an anti-apartheid freedom song lamented by the mineworkers moments before live ammunition was discharged; and blasts from the mine recalled by low-frequency sonic vibrations of the surrounding landscape emanating from an outcrop of granite boulders on the site. Haroon Gunn-Salie, Senzenina, 2018. 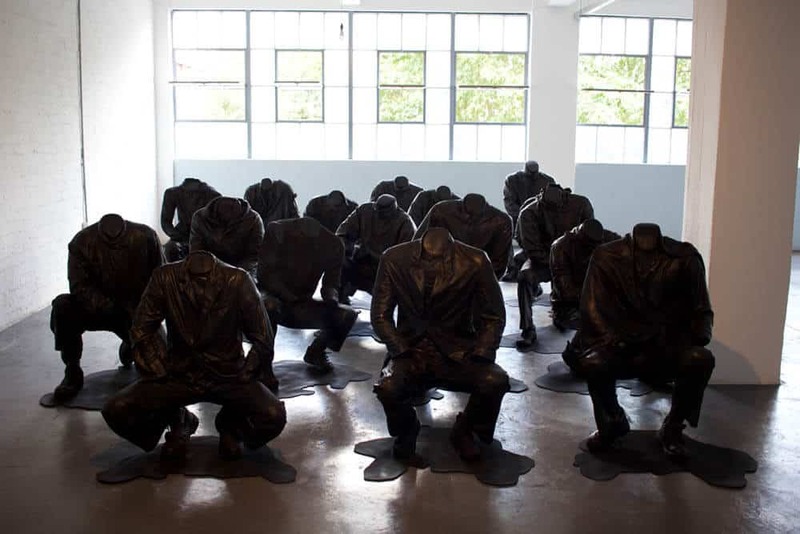 Sculptural installation with sound element, 17 life-size crouching figures. Each Figure: 27.6 x 39.4cm. Courtesy of the artist & Goodman Gallery. Since graduating, Gunn-Salie’s work has featured in a number of significant exhibitions and projects: Simon Castets and Hans Ulrich Obrist’s 89-plus project, for which he participated in the 89plus programme with Obrist at the 2014 Design Indaba in Cape Town; Making Africa: A Continent of Contemporary Design, which travelled to the Vitra Design Museum and Guggenheim Museum Bilbao (2015); What Remains is Tomorrow, the South African Pavilion at La Biennale di Venezia (2015); the 19th Contemporary Art Festival Sesc_Videobrasil (2015); Frieze Sculpture in Regents Park, London (2018) and Songs for Sabotage, The New Museum Triennial (2018). Gunn-Salie was placed in the top five of the Sasol new signatures competition in 2013. At the 19th Contemporary Art Festival Sesc_Videobrasil in 2015 he was awarded the first ever SP-Arte/Videobrasil prize, designed to encourage and publicise the work of young artists whose lines of research focus on the debate surrounding the global south. As part of the award, Gunn-Salie presented a solo exhibition at Galpão VB during the SP-Arte fair in São Paulo in 2016. All galleries participating in the FNB JoburgArtFair are given the opportunity to nominate one of their artists for consideration by the jury. This year, Goodman Gallery nominated Gunn-Salie for the prize.